3 shows, 3 cities, 7 days, 934 miles! Since we don't live in the same state or time zone, every concert is essentially a concert on tour. This time, we met in Chicago for a mini-tour. Nov. 29 & 30 - Met each other in Chicago for a couple days of intense rehearsals. Got to hang out a little bit with Sean Connors of Third Coast Percussion. Dec. 1 - Performed with clarinetist Cory Tiffin of the Anaphora Ensemble for the third annual "Sounds of Chicago" concert at the Green Mill. Dec 2 & 3 & 4 - More intense rehearsals in between Chris' coursework and teaching commitments. Lots of technology angst while trying to make a MAX patch work with the hardware we already have. A trip to Guitar Center for a hardware solution to our MAX patch problems. Rehearsal set up for Matthew Joseph Payne's Echoloquacious. Dec 5 - Rehearsals and then our official EP release show at Eastman. 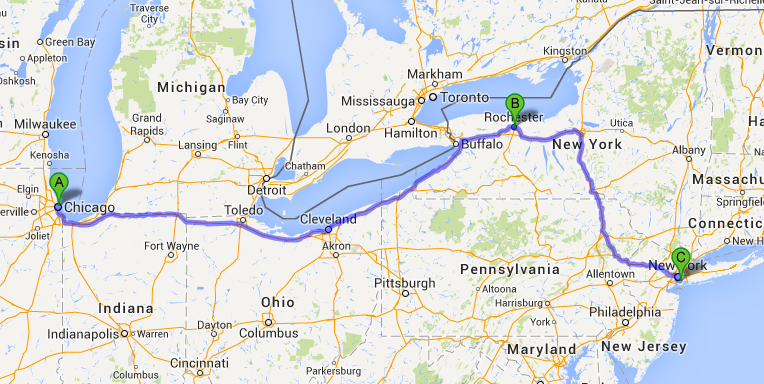 Dec 6 - Drove from Rochester to Brooklyn. First order of business when we got into town was getting some vegan pizza by the slice at Vinnie's. Dec 7 - Slept in! Another trip to Guitar Center for drum hardware. Averted minor disaster twice: First, realized that we left a score in Rochester (oops!) and sent a print/bind order to a local FedEx Kinkos. Then, got to Kinko's 9 minutes after it closed and almost didn't get the score...THANK YOU to the Kinko's employee who gave us a break by letting us pick up our order after closing!! Loaded in and performed at the Brooklyn Conservatory of Music as part of the "Brooklyn's Own" series curated by Daniel Felsenfeld! Thanks to everyone who came to our concerts. We look forward to more adventures in March 2014!